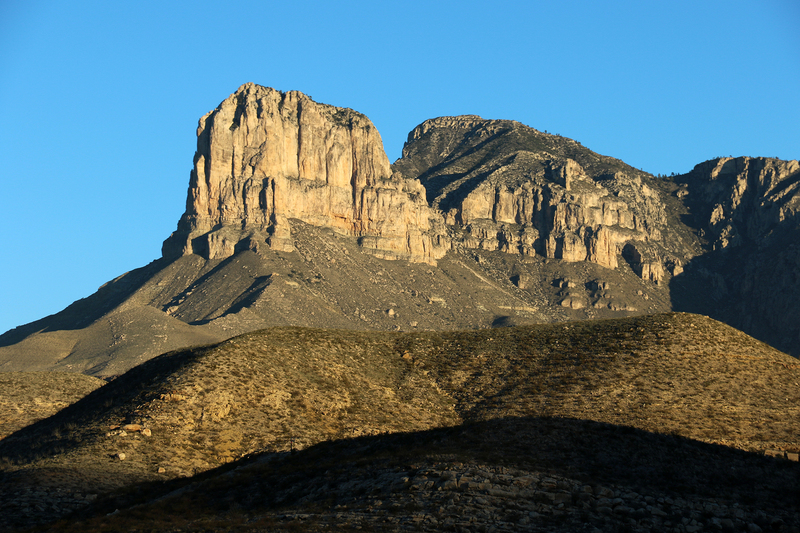 The Guadalupe Mountains, part of the vast Basin and Range Province of north-south trending mountain ranges in western North America, rise like a mighty, sixty-five mile long island reaching some 3,000 feet above the Chihuahuan Desert. The mountains are roughly shaped like a V. Much of the northeast segment in southern New Mexico is protected by Carlsbad Caverns National Park (46,766 acres, est. 1930, 500,000 annual visitors). The southern tip of the V, which is also the highest, dips into Texas and is protected as Guadalupe Mountains National Park (86,367 acres, est. 1972, 225,000 annual visitors). Most of the remainder of the range in New Mexico is comprised of the southern part of Lincoln National Forest. The eastern side of the V, the side protected by the National Parks, is an exposed segment of the largest fossilized coral reef on the planet, Capitan Reef, much bigger than any living reef that exists today. This side of the range boast rugged peaks (the four highest peaks in Texas) and celebrated cave systems (easily accessed Carlsbad Caverns and off-limits Lechuguilla Cave). Like the Chisos Mountains to the south in Big Bend National Park (where I spent my 35th birthday), the Guadalupes are ecosystem islands preserving in their high country forests of Ponderosa Pine, Douglas Fir, and White Pine that vanished from the low country as the glaciers of the Ice Age retreated and the region became hotter and drier. In Guadalupe Mountains National Park, the slopes and high country are federally designated wilderness, accessed by a series of trails that lead to a small constellation of primitive backcountry campgrounds (much like Isle Royale National Park). From the beginning of Sean’s and my National Park adventures, I have always been fascinated by the lesser known Parks, the B- and C-list, if you will. Of all the National Parks in the system, I’ve long been most excited to visit Guadalupe Mountains. In fact, I first read the Falcon Guide for Guadalupe Mountains and Carlsbad Caverns years ago. Like six or seven years ago. In fact, our 2013 trip to Big Bend happened in part because I wanted to save Guadalupe Mountains and Carlsbad Caverns for when we had more time. 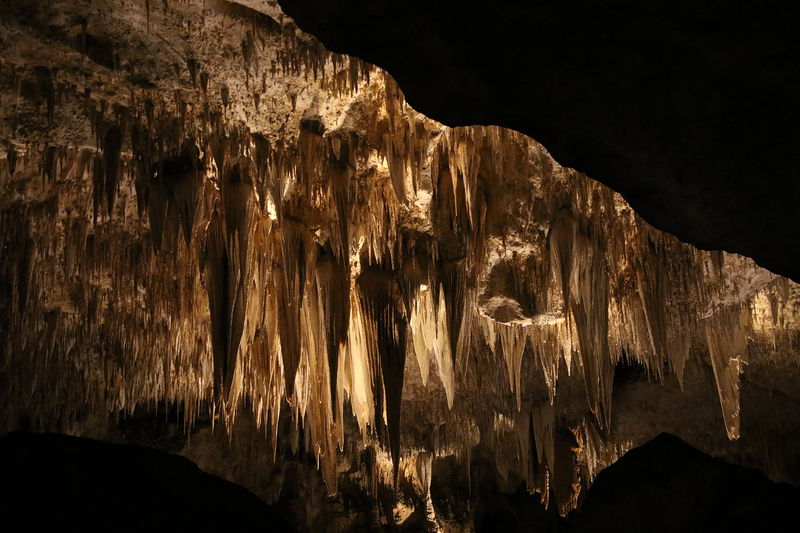 After turning 35 at Big Bend (and joking afterward that if you’d told me I’d spend my 35th birthday in Texas, I’d have told you that you were crazy), Guadalupe Mountains/Carlsbad Caverns emerged as the obvious trip for my 40th. In fact, it was so obvious that I don’t remember a moment where I “decided” that a trip to these Parks was how I wanted to spend my 40th. Even before we returned to Chicago from Big Bend, it was just a fact. As long as two years ago, I began to gauge interest by mentioning the trip to friends and family who might like to join Sean and me on this adventure. In October 2017, I sent the first email invitation to intimates who were into camping, hiking, and the National Parks. Slowly over the following year, the trip came into clearer focus. I even made a planning website. For the backpacking trip, by far my first choice, if we could make it work, was a one-way, three-day, two-night trek from Pine Springs to McKittrick Canyon. Since it was one-way, it required transportation from one trailhead to the other, which was possible with companions. Backcountry permits had to be obtained in person at the Park and car camping at the twenty-site campground at Pine Springs was first-come, first served, so the actual prep for Guadalupe Mountains involved little more than dates. This freed me up to stress about an AirB&B in Carlsbad. For a long time, it looked like our group (whatever size it was) would have to split up into two or even three smaller houses in Carlsbad. There was a large place out in the dessert north of town, but it was pricey and would have needed a bigger number of people to commit early for it to make sense. Then in September, a perfect house on the north side of Carlsbad appeared on AirB&B. I sent it around to those who’d committed to the trip. With their swift approval, I snapped it up. In the end, an invitation list of about twenty-five solidified to six adults and two small children. There were many people who wanted to come but couldn’t swing it due to work, expenses, or (unfortunately) injuries. The final group included Phil and Adam from Detroit, Sean’s and my first and most consistent National Parks companions, and their son Sylvan. Phil has family in Texas, so they planned to combine my birthday trip with a Thanksgiving visit. The other set of companions was one of my closest friends from work, John, and his wife Catherine and their daughter Mariana. Sylvan and Mariana are fewer than six weeks apart in age and both about two, so that worked out very nicely! In the end, Sean and I would be doing the backpacking portion alone. Then Adam and Phil and Sylvan would drive down from Detroit and join for car camping. Then John would drive down from Chicago and pick up Catherine and Mariana who would fly down and join for the AirB&B.